My original review of Spider-Man: Homecoming from July 2017 is here. 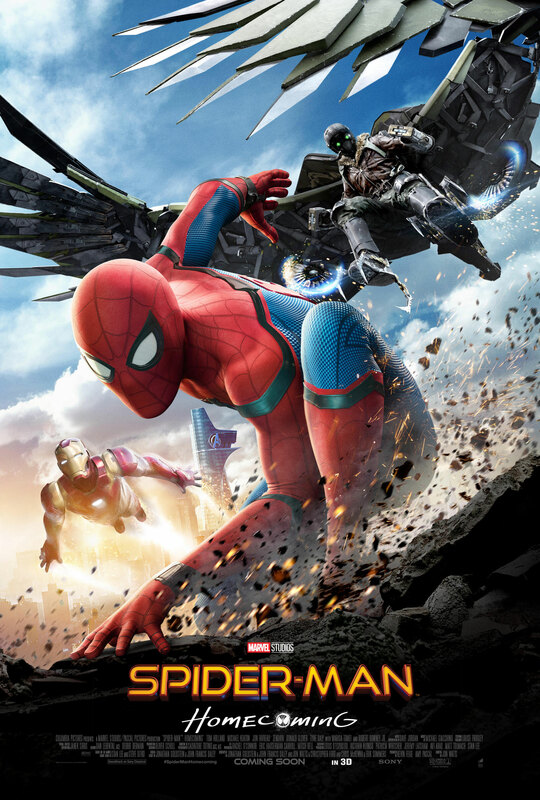 After battling with (and against) the Avengers in Berlin, Peter Parker (Tom Holland) struggles to return to his everyday high school life as he continues to be a superhero. When Peter stumbles across a group of thieves with high-tech weaponry, he finds himself on the trail of the Vulture (Michael Keaton). Spider-Man: Homecoming is an origin story without rehashing old ground we’ve seen before in the previous Spider-Man films featuring Tobey Maguire and Andrew Garfield. We know about Uncle Ben and the radioactive spider and don’t need to see that again, so instead this is an origin story in terms of Peter growing, learning and becoming the hero he can be. Tom Holland is a great Peter Parker and a great Spider-Man. He’s nerdy and funny while still being somewhat naïve when it comes to how unfair the world can be. Peter’s still learning how to be a hero, and he makes some pretty big mistakes along the way, but he’s so earnest in wanting to help people and do the right thing. Tony Stark (Robert Downey Jr.) does make a couple of appearances in Spider-Man: Homecoming but it’s in a mentor-role to Peter. Peter desperately wants to impress Tony and to be a part of the Avengers, while Tony wants Peter to be a better person than he is and not get caught up in anything too dangerous. Michael Keaton’s the Vulture is a compelling and imitating villain. From his first scene, you get where this guy is coming from. He’s a working-class guy who wants to take care of his family but is knocked down by bureaucracy and people like Tony Stark. Michael Keaton is brilliant as Vulture, I’m pretty sure he never shouts, but that makes him all the more intimidating. Vulture’s goal isn’t to end or take over the world, it’s a much more personal goal which makes the conflict between him and Spider-Man compelling. Spider-Man: Homecoming is a coming of age story, with high school comedy moments, while still being a superhero movie. It blends these elements together really well and it’s a fun film with great characters. The relationship between Peter and his best friend Ned (Jacob Batalon) is the best and all the kids and teachers in Peter’s high school feel like the sort of people you’d meet in high school without being cliché. Spider-Man: Homecoming is as charming and fun as it’s titular character and that makes it a great film, with a lot of heart. 4/5. My original review of Captain America: Civil War from May 2016 is here, and my spoiler-filled rambling review is here. After a series of a mission that put the public in danger, the Avengers are told they need to be regulated by the U.N. While Tony Stark (Robert Downey Jr.) believes their actions need guidance, Steven Rogers (Chris Evans) doesn’t trust politician’s involvement. The rift between them causes a divide in the team that’s only furthered when Steve’s friend and former assassin Bucky Barnes (Sebastian Stan) reappears. Captain America: Civil War does a great job at showing both sides of this conflict over the Sokovia Accords – the agreement that will put the Avengers in check. You not only get to see both Steve and Tony’s opinions on it, but also why various other characters ultimately end up on a certain side. The film shows how there’s shades of grey in these opposing views and that’s where some characters end up, Natasha (Scarlett Johansson) is the notable example of this. For a film jam-packed with superheroes Captain America: Civil War never feels overcrowded. This is due to the script and how the story is continuously moving on from one conflict or reveal to another. Each character has their moment to shine, though for some that may last longer than others, and it’s a thrill to see these character’s we’ve seen over the course of multiple films fight together and against one another. You feel for these characters and their strained relationships because you’ve grown attached to them over the years, and because all the actors involved give brilliant performances – Downey Jr. and Stan especially. There are some characters making their first appearance in Civil War, Black Panther (Chadwick Boseman) and Spider-Man (Tom Holland), and both of them make a big impression and leave you wanting more from their individual films. The action sequences are exciting and are on the whole well-shot and easy to follow. The humour that runs through the film never detracts from the seriousness of the situations the heroes finds themselves in, instead it gives you a brief moment to breathe before the tension builds once again. At Civil War’s heart it’s a story of friendship. The friendship between Steve and Bucky that’s spanned decades and the new one between Steve and Tony which has never really found its footing. 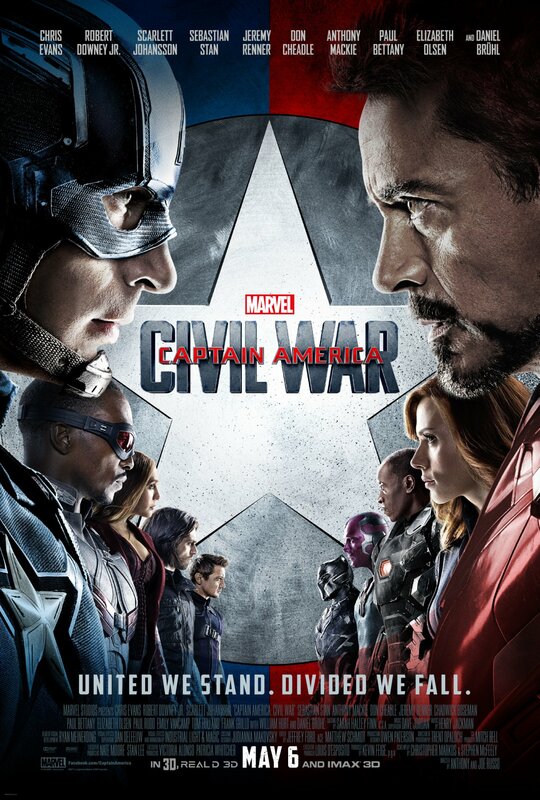 Captain America: Civil War has it all, great action sequences, humour and drama but it never forgets about what is important – the characters, their motivations and their relationships. There are some minor quibbles like the tonal palette of the film is decidedly grey and it could be argued it’s more Avengers 2.5 than Captain America 3, but all in all it’s a fantastic film. 5/5. Peter Parker (Tom Holland) is living his everyday life as a high school kid and as the friendly neighbourhood Spider-Man but after fighting with (and against) the Avengers, Peter wants more than that. When Peter discovers alien weapons are being sold, he comes up against the Vulture (Michael Keaton) a threat bigger than he’s faced before. Spider-Man: Homecoming is a fun film. It very much feels like a teen comedy that just happens to have superheroes and that’s no bad thing. Seeing Peter in school, going to class, having to deal with annoying kids like Flash (Tony Revolori) and having a crush on popular girl Liz (Laura Harrier) was all great and Tom Holland played Peter Parker so well. I loved Peter’s friendship with Ned (Jacob Batalon), they felt like proper besties and it was great having someone knowing Peter’s secret identity from pretty early on in the film. The story is a lot more small-scale than the threat-to-the-entire-world type plots we’ve seen in superhero films over the past few years. This was a good move as it gave more time for the characters and when there were stakes you felt them. That being said, the villain is an intimidating one and one of the best the MCU has had in a long time. Keaton nails the role, bringing menace and a certain affable charm to a character that could have been a pantomime villain. I also liked how Spider-Man: Homecoming fitted into the MCU. Yes, there’s appearances from Happy Hogan (Jon Favreau) and Tony Stark (Robert Downey Jr) but they don’t overshadow Peter and his story. If anything, Peter conversations with Tony are equal parts funny and sincere. The humour didn’t always work for me. Peter is a kid who’s a hero so he sometimes makes stupid jokes and doesn’t think things through, and while that’s so perfectly Spider-Man, it just didn’t always hit the mark with me. I liked Spider-Man: Homecoming but I didn’t love it. Breaking the film down like this there were a lot of elements I liked but for some reason together they didn’t give me the wow factor. Still, Spider-Man: Homecoming is an enjoyable film that will at least make you smile. 3/5.